Today’s blog post is extra special as I’m having a chat with my sister, Charlotte! For a while now, she’s been raving about essential oils. She uses them for just about everything! Every time I walk into her house it smells absolutely lovely. Not in a chemical-y way, but in a natural, earthy way. I, myself, sometimes recoil from the smell of strong household cleaners and bleach. 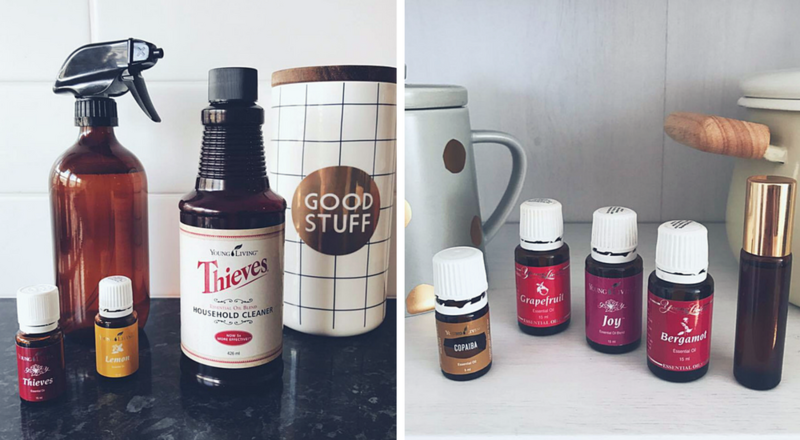 Charlotte uses the Young Living Thieves Essential Oil blend (a mixture of clove, lemon, cinnamon bark, rosemary and eucalyptus) as a natural alternative to aggressive, shop-bought household cleaners. How long have you been using essential oils and why did you decide to try them? I’ve been using essential oils for about 6 months! I wanted to give them a try because of many testimonies of the benefits and power of oils, so I wanted to see what all the hype was about. I also sought them out as natural support for issues relating to sleep, stress and anxiety. What oils do you use, and for what purpose? Thieves cleaner and oil (a mixture of clove, lemon, cinnamon bark, rosemary and eucalyptus) – this is the only cleaner I use around the WHOLE house now and it smells like Christmas, not a hospital! It’s anti bacterial and free from harsh chemicals found in store-bought cleaners. Lavender and cedarwood in the diffuser for sleep support, and their calming effect. Also used in the bath. Peppermint for headache relief and energy support. Citrus oils such as grapefruit, lemon, bergamot and orange are amazing to use to feel uplifted, and when diffused throughout the home, they totally override any nasty smells in the house. I also use oils to make my own linen sprays, cleaners, air fresheners, body sprays and roll ons. They smell absolutely incredible! When I spray them I’m not worried about breathing them in – because I know I’ll be taking on all the benefits of the oils without putting myself in danger of breathing in chemicals. I’m so glad I started using essential oils, they’re now a part of my everyday life. They make me see that it’s possible to use natural products and see great results. Here is a massive list of essential oils and their properties/health benefits! Previous For The Love Of Meat? Next Putting Stress Into Perspective.